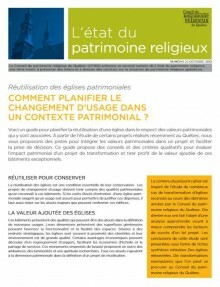 This serie of reports aims to look at an issue or major aspect of the protection or enhancement of religious heritage. It is fueled by research, studies, and surveys by the Québec Religious Heritage Council, especially the information watch on changing churches, namely those that have been closed, sold, or converted to new uses. 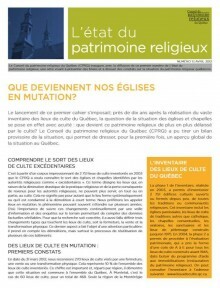 The Québec Religious Heritage Council presents another facet of the current situation of changing churches based on an extensive survey across Quebec. This document describes the commitment of municipalities to religious heritage matters, particularly at a time when churches are increasingly being closed, put up for sale, and converted to other uses. The aim is to highlight the different ways in which cities and towns get involved in what appears to be a local development issue. Reuse of Heritage Churches . How to Plan the Change of Use in a Heritage Context? Here's a guide on how to plan reuse of a church while respecting its heritage significance. After studying some recently completed projects in Quebec, we offer you some ways to integrate the heritage values into a project and facilitate decision making. This guide provides tips and qualitative criteria to assess the heritage impact of a transformation project and take advantage of the added value of these exceptional buildings . What Is Happening to Our Changing Churches? Nearly ten years after completion of the vast inventory of places of worship in Quebec, the question of the status of churches and chapels is acute: what is happening to this religious heritage increasingly abandoned by the cult? 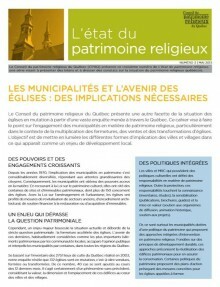 In this document, the Québec Religious Heritage Council has made a provisional assessment of the situation, which for the first time provides a comprehensive overview of the situation in Quebec.